Any form of exercise puts pressure on your knees and bushwalking is no exception. 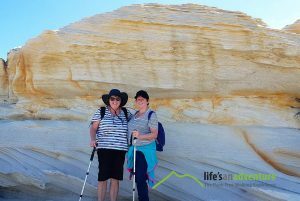 It’s highly likely on a Life’s An Adventure guided walk you’ll be hiking up and down hills, rockhopping, beach walking and even a bit of scrambling so you’re going to want your knees to be in tip-top shape. Now, knee pain can affect anyone at any time so it pays to know what the cause could be and what to do about it. Knee pain may be the result of an injury, such as a ruptured ligament or torn cartilage. Medical conditions – including arthritis, gout and infections – also can cause knee pain. The good news is many types of minor knee pain respond well to self-care measures. Physical therapy, anti-inflammatories and knee braces also can help relieve knee pain. In some cases, however, your knee may require surgical repair. Excess weight. Being overweight increases stress on your knee joints, even during ordinary activities such as walking or going up and down stairs. Lack of muscle flexibility/strength. A lack of strength and flexibility are among the leading causes of knee injuries. Tight or weak muscles offer less support for your knee because they don’t absorb enough of the stress exerted on the joint. Certain sports. Some sports put greater stress on your knees than do others. Such as long distance running and skiing. Alway stretch before any exercise. Maintain a healthy weight. It’s one of the best things you can do for your knees. Every extra kilo puts additional strain on your joints, increasing the risk of injuries and osteoarthritis. Practice perfectly. Make sure the technique and movement patterns you use in your sports or activity are the best they can be. Lessons from a professional can be very helpful. Get strong, stay flexible. 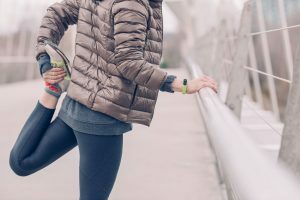 Because weak muscles are a leading cause of knee injuries, you’ll benefit from building up your quadriceps and hamstrings, which support your knees. Balance and stability training helps the muscles around your knees work together more effectively. And because tight muscles also can contribute to injury, stretching is important. Be smart about exercise. If you have osteoarthritis, chronic knee pain or recurring injuries, you may need to change the way you exercise. Consider switching to swimming, water aerobics or other low-impact activities – at least for a few days a week. Have the correct footwear for the right activity and replace your shoes before they wear right down. A pair of walking poles can also relieve pressure and weight off your knees. Happy knees = happy walker!